SOSA MAZATLAN REAL ESTATE Own a piece of ParadisE!! RENTED/LEASED $1,250.00 Monthly AMAZING MARINA VIEWS!!!! "NICE & BEAUTIFUL CONDO AT LA MARINA.!!!!" Can't find the right rental in Mazatlan? CHECK COSTA VELEROS @ MARINA MAZATLAN!!! 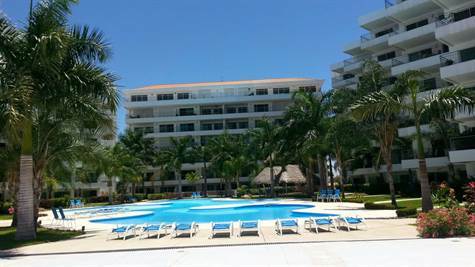 2 BDS CONDO - UNIT WITH ONE OF THE BEST VIEWS OF MARINA MAZATLAN !!! At Marina, just steps to the beach, this spacious 2 bedroom, 2 bathroom condominium is perfect for your next Mazatlan vacation! Fully equipped with everything you could need , washer & dryer, air conditioning throughout and T.V. with Megacable. There is also highspeed wireless internet available during the winter season. Master BD with King size bed & 1 SINGLE BED - The property also has 2 complete bathrooms. A great option for 4 people! The kitchen is of the perfect size and comes complete with all of the kitchen wares you would need. The living room and dining are spacious and the terrace facing MARINA MAZATLAN. Forget all about hassles and worries, take a break & come enjoy the beautiful & warm mazatlan weather on a huge balcony that open up directly to AMAZING MARINA VIEWS!!!!! Enjoy an a walk through the new and exclusive Marina boardwalk lit up by beautiful evening lighting with a reflection of the boats shining on the water on one side and live music, shops, and restaurants on the other. ESTAS BUSCANDO UN HERMOSO CONDOMINIO EN RENTA CERCA DE LA PLAYA EN LA MARINA?? Condominio lujoso y amplio de 2 recamaras y , con una terraza amplia con vista a la marina, ofreciendo extraordinarios amaneceres y atardeceres….!!! Este condominio se encuentra en 3er piso ..!!! Locacion: Marina Mazatlan COSTA VELEROS ¡!! EL MEJOR LUGAR PARA PASAR TUS VACACIONES!!! Lobby con acceso a internet!! Alberca con vista a la marina. Cualquier duda o para mas informes por favor contactanos!!! !